*UPDATE* According to NBC News and other news sites, Aisha Khan was alhumdollilah found earlier today. With patience, Allah (Swt) only does the best. OVERLAND PARK, Kan. – A missing 19-year-old Olathe woman was found safe Wednesday. 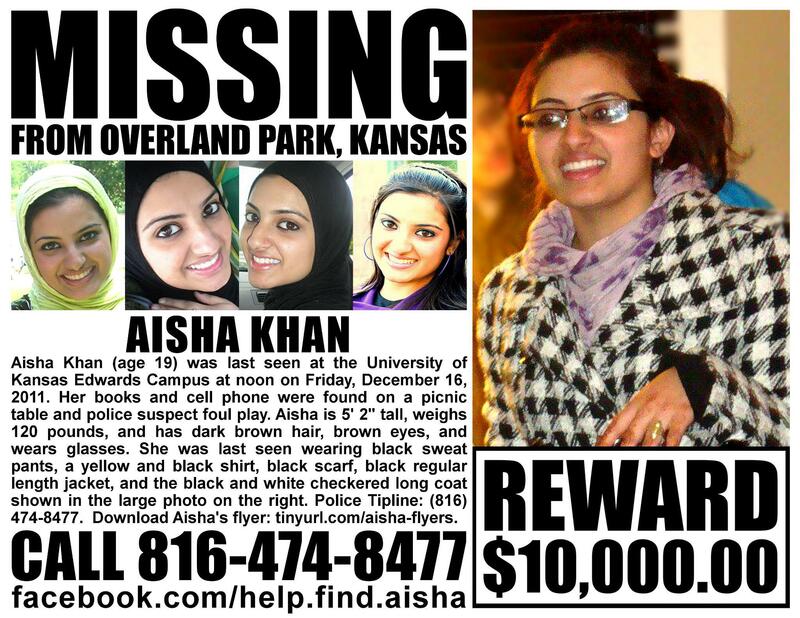 Aisha Khan, a student at Johnson County Community College, disappeared on Friday, Dec. 16. Around 10:15 p.m. Wednesday, Overland Park police said officers personally made contact with Khan. They verified her identity and safety. She was not abducted or held against her will. “We are all pleased she was found safe and sound,” said Overland Park Police Chief John Douglass in a news release. Police said there is no criminal investigation and declined further comment. Aaner Trambu, a family friend, released a statement on behalf of the family late Wednesday evening. He said prayers have been answered and the family is grateful to all the people involved including volunteers, friends, extended family and all law enforcement. Police had been searching for Khan since Friday. She was at the University of Kansas Edwards Campus in Overland Park when she left her sister a voice mail saying she was assaulted by a stranger. When the sister drove to get her, she found only her book bag and cellphone. Overland Park Police Chief John Douglass said earlier this week that Khan’s disappearance was classified as a missing case, but police would devote resources typical of an abduction case. Officers said they searched the campus on horseback, interviewed family members and students on campus and even looked through surveillance video from a nearby gas station. KU Edwards Campus does not have any surveillance cameras . The parents of Kelsey Smith, who was abducted from an Overland Park parking lot and murdered in 2007, met with Khan’s Monday night. The Smiths offered support and coordinated efforts to find their daughter. Earlier on Wednesday, family members and volunteers put up fliers in a 15-mile radius around the area where Khan was last seen. MV: Just a few days ago, one my friends here Texas informed me that one of his good friend’s sister has gone missing a possibly (God forbid) kidnapped after a man had harassed her. Upon hearing that my friend drove all the way to Kansas to help her family out but unfortunately, she was no where to be found. Only a few days after, the story of her disappearance has been throughout the news and on the internet. Imagine the stress and fear her family is going through. Please pray for her and if you know anything at all, call the number bellow. OVERLAND PARK, Kansas — Overland Park police are looking for a 19-year-old Johnson County Community College student who was last seen at the University of Kansas Edwards campus just before noon Friday. Before Aisha Khan disappeared, she left a voice message on her sister’s phone. According to her sister, Khan had been sitting on a bench on campus when a stranger approached her and assaulted her. She managed to run away and place the phone call to her sister. When the sister got the message, she tried calling Khan back, but there was no answer. When Khan’s family arrived at the location, they found her belongings, including her cell phone, but Khan was missing. Police searched a wooded area near the campus Saturday. Khan’s family is handing out thousands of fliers and is offering a $10,000 reward in the case. Khan was last seen wearing black sweat pants, a yellow-and-black shirt, black head scarf, black regular-length jacket, and a long outer jacket that is black and white. She is described as 5-foot-2, 120 pounds with dark hear and brown eyes. Police say she may or may not be wearing glasses. Anyone with information on her disappearance is asked to contact the Overland Park Police Department or TIPS Hotline, 816-474-TIPS. Click here to watch a video about her. one of many out-of-town relatives who have traveled to the Kansas City area. You can follow updates about her through twitter, as well as on her Facebook page. May Allah (swt) protect her and bring her back home safe insh’Allah. Ameen. My mom will give the Quran Ayat which will help to find your daughter InshaAllah in days . You can email me at dearkhan@aol.com and i can give you her contact number. There is no greed of money but to help only. Thanks for your concerns, Jazakullah khair. She was no my daughter (not even married yet) however and alhumdollilah the good news is, she was found. With patience, Allah (swt) only does the best.